I was never aware that I had a future in running beyond High School. I knew I was a decent runner, but I never put in an all out effort to prove that I was on another level, because I didn’t believe I was, and as far as could tell, no one else did either. I ran cross-country and track, but track was my favorite. I was a hurdler. I loved the 100M hurdles, but really, the 300M hurdles were my specialty. The 300M hurdles is a very tough event. I ran it a few times throughout high school, I performed horribly and wonderfully, but my heart was in the 100M hurdles, so even though I knew the 300M distance was better suited for me, (revealed by my coaches and my gut), I never paid attention to it. Instead, I chased after the 100M distance. I kept improving every year, until finally achieving the mystical, yet necessary “3-Step” the week after my junior season, which meant I was ready to hit it hard for my assumed final year of competitive running. 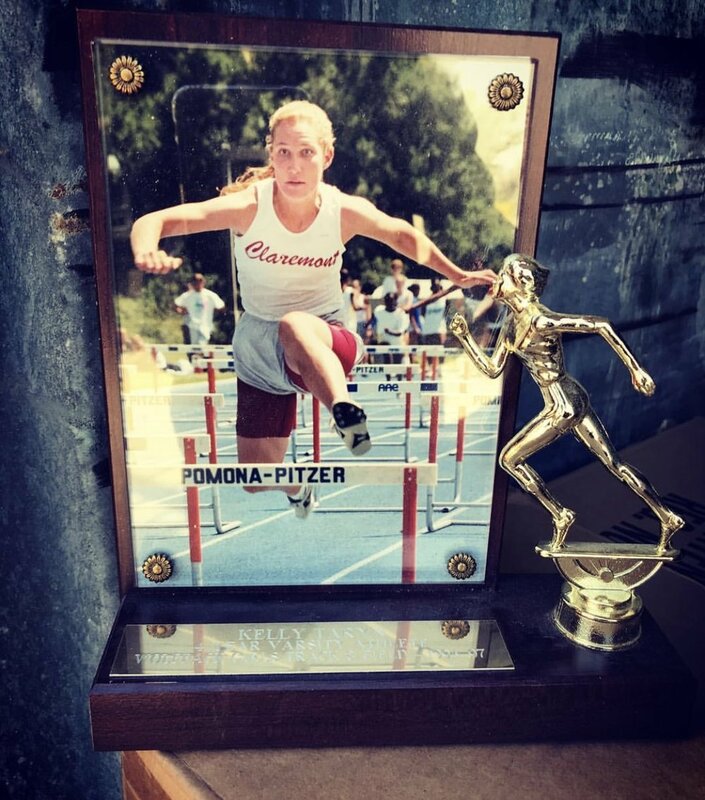 Racing the 100M hurdles at the Claremont Invitational, 1997. Everything was humming along nicely at first. I consistently placed in the top three of the 100M hurdle races my Senior year, however, when our League Finals meet came around, I flipped the switch, and placed second, thereby qualifying for the CIF Prelims where I would compete against other hurdlers in the extremely competitive southern section of high schools in California. I ran in the 300M hurdle event at League Finals, too, and felt great, but I slowed down near the finish, (I even waved at a couple of friends cheering me on in the crowd), because I did not want to place high enough in that that race to move on to CIF Prelims. The reason my priorities were out of whack, was because the 300M hurdles were scheduled late in the afternoon, whereas the 100M hurdles took place in the morning on the day of the Prelims, and on any other Saturday of the year this would not be a big deal, except my Senior prom was held that Saturday night. On the morning of May 18th, 1997 I drove an hour or so from my home in Claremont to El Camino College in Torrance where the CIF Prelims were held; I walked to the track, checked in, warmed up, lined up in my heat in lane #2, and ran my slowest 100M hurdle race all season. I wasn’t disappointed; I was numb. Next, I gathered my clothes, walked to my car, drove home, and spent the rest of the day getting ready for prom. I am sure there are details I missed, but it is all an embarrassing blur that I have tried to bury and forget about for over twenty years. It only came to the surface last week during a challenging run workout when the same question and answer kept spinning around my mind, "Why is this pursuit/obsession with achieving the goal of earning my pro card in triathlon barreling down on me now?" **I also just read David Goggin’s book Can’t Hurt Me, and he challenges the reader to really go deep in fantastic and difficult ways. It’s an excellent, but exhausting read. The fact is, on that long-ago Saturday morning in Torrance, I felt out of place. No, I was straight up scared. I was competing against girls much faster than me, or so I believed. I will never know. I gave up before I started. I shouldn’t even have wasted over two hours in the car that day commuting to and from the meet, because my heart and ambition didn’t even make into the car. The really shameful part is that I probably wouldn’t have moved on to the CIF Finals in the 100M hurdles even if I ran seconds faster than my Personal Best, but I probably would have in the 300M hurdles. Not that day, definitely not in that mindset, but if I had given them the attention they deserved, or rather the attention that I deserved pursuing my own potential learning how to run them all four years of high school, I believe I could have achieved something special. 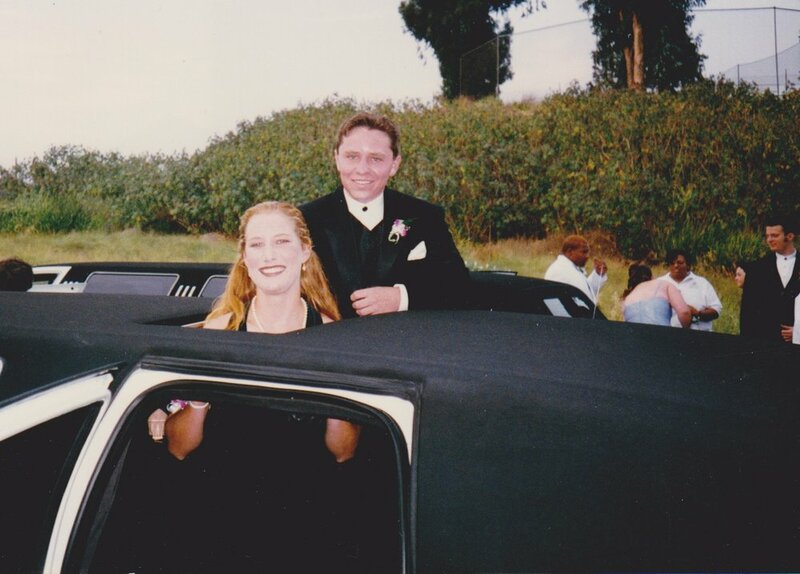 Yours truly with my wonderful date, Andy Newman, Prom night, 1997. Granted, I was only seventeen, and even though I convinced myself that the conflict with prom was a justifiable reason to phone in the last couple of races I ran in high school, it wasn’t. I knew it then and I know it now. I just never believed that working that hard was worth it. I saw no running in my future at the time, and figured prom was more important, or at least the ritual beforehand was. I would have made it to the start of the dance, I had friends who ran in later events at the track meet who did, but I wanted to enjoy the whole pomp and circumstance, and not be rushed. Regrettably, that immature decision locked me away in “What if?” purgatory for over twenty years. I’ve been chipping away at the wall to escape ever since. Andy Dufresne's Bible that he hid his rock hammer in from the fantastic film, Shawshank Redemption. On November 20th, 2017, I finally saw the light. I know there is a slim future on the other side of my pursuit to be a professional triathlete. I’m not twenty-nine, (the age I was when I first felt the pang to go after it); I’m turning forty in September. At best, I might toe the line wearing a “P” on the back of my calf a handful of times over the next few years, (BONUS: My attendance might help another pro snag a KQ), but if I don’t, that’s fine, too. The fact is I am in the best shape of my life now, at thirty-nine years old, and after over a decade of chiseling away at the gigantic block of marble that is swim, bike, and run, I simply can’t live the rest of my life knowing I didn’t try to grab my goal when I had the chance. There are no distractions now, my priorities are crystal clear, and the clock is ticking. I need to find out for sure if I am fast enough to line up with the best.